There are three Television programmes that have shaped the person I am today. 2. Twin Peaks gave me my imagination and ability to look beyond the apparent. 3. The Prisoner fired my intelligence and made my question everything. Actually The Prisoner was my “angry young man” programme – I discovered it in 1992 and it spoke to and shaped my 20 year old mind like no other, it almost turned me into a proto Number 48, rebelling against all conventions because they are there to be rebelled against. Today I look back at my 20 year old self and laugh – the long hair, the makeup, the attitude – you see the Prisoner stirred up something that had been dormant in me, it stirred up my very own internal number 6 which made me view the world as the Village. The 2009 re-imagining with Jim Caviezel and Ian McKellan was interesting but didn’t carry the ethos – McKellan plays Number 2 for the whole series, and it somehow lacks charm – even though it deals with the same themes of paranoia and isolation – it doesn’t quite feel right. 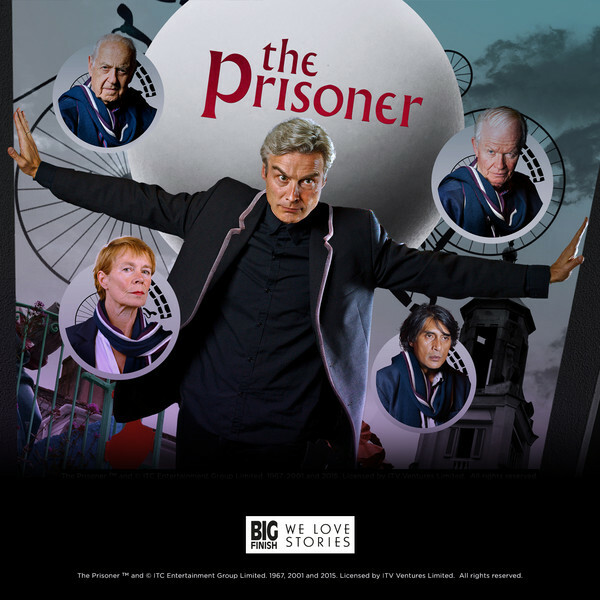 So in early 2015 it was announced that Big Finish were going to be re-imagining The Prisoner my response was lukewarm. Under the guidance of Nick Briggs my response – hooray! and over the last 12 months they have teased out little morsels of information (information… information! ), casting was announced and a brave decision to cast relative unknown Mark Elstob as Number 6 rather than going for a name, and Four outstanding actors to play Number 2 – John Standing, Celia Imrie, Ramon Tikaram and Michael Cochrane and that three of the four stories would be retellings or reimagining of TV episodes “Arrival”, “The Schizoid Man” and “The Chimes of Big Ben” with an original episode “Your Beautiful Village” written by The Briggs-Master himself. Surely it couldn’t fail??? No it couldn’t, of course it couldn’t – Big Finish have produced a bold and brave retelling of the original, keeping everything that worked in the original, but giving the series a lot more edge, actually a lot more cruel and disturbing feel. Elstob as Number 6 is a lot more angry than the wry performance by McGoohan – Elstob is a raging unstoppable torrent of anger at his situation – the actors playing Number 2 all have a glee and a zeal, they seem to enjoy their job and the power that it gives them over the village inhabitants – and this deliberate cruelty is the biggest change in emphasis – yes Number 2 is charming and avuncular but if they do not get what they want they will use extreme methods because they can and because they enjoy exerting their authority, not only over Number 6 but over the Village as a whole. Starting with a meeting in Belgium, Agent ZM73 resigns from his job as a top secret agent – he is about to go on Holiday to the Bahamas but blacks out and wakes up in The Village and in the Village he is designated Number 6. So begins the odyssey in this retelling of Episode One – it is expanded and added to but keeps the ethos of the original perfectly. There is an edge of hysteria running through the proceedings – technology seems much more of the “now” than of the 1967 that it should be – Virtual reality maps, tablets are “the latest thing”. There are also clones in the village, the Taxi Driver, the telephone operator, the announcer are all played by the same person. This episode also introduces us to Number 9 (Sara Powell) who will become very important to Number 6 over the course of the set. This episode has John Standing as a commanding and very British Number 2, only for him to be mysteriously replaced by Celia Imrie towards the end of the episode and she carries on as Number 2 in the next episode. Carrying on directly from Episode One – the new Number 2 (Celia Imrie) enacts her plan to crack Number 6. This is another retelling of a TV episode. Number 6 somehow forms a psychic bond with Number 9, she can read his mind and they perfect a mind reading act for the upcoming Village Festival. Then one morning Number 6 wakes up in a new house with a moustache and different hair and everyone is calling him Number 12, what is more unnerving is that an exact copy of him is living in Number 6 house and claims to be Number 6. Playing on the theme of identity and reality Imrie’s Number 2 has a delight and glee in what she is doing, she also has a cruel self confidence as she works to engineer a crisis point so that Number 6 will break. Cold, calculating and cruel but utterly compelling. Some episodes of The Prisoner were just plain weird – Free For All, Living in Harmony and Fall Out being prime examples and this one is up there with these episodes – in fact it is my joint favourite Prisoner episode. It is harsh cruel, demented and downright disturbing – Number 6 experiences the ultimate sensory deprivation, he has lost his sense of sight and smell, he can use the phone and does this to contact Number 9 for help -but no other sounds from the village can be heard – Number 9 is suffering this as well as apparently is the new Number 2 (Ramon Tikaram) who talks of a catastrophic system failure in the Village. Incredibly Kafka-esque (read Before the Law for a comparison) – you get the feeling that the Village is there for a specific purpose and also that for all their supposed power Number 2 is just as much an inmate and victim of the Village as Number 6. A classic. The set finishes with another retelling of a classic episode, this time the highly regarded The Chimes of Big Ben. The new Number 2 is Michael Cochrane, and his doddery avuncular personality soon gives way to a hard edged tyrant. Again this pretty much follows the plot of the TV episode with 6 befriending the new Number 8 and planning an escape to London. Those familiar with the TV episode may be surprised at how this pans out, it certainly caught me off guard. There is also a fifth disc of bonus features and interviews. What else is there to say? The Village is under safe hands under the Chair-Person-ship of Mr Nick Briggs – the series is given the respect it deserves and brought right up to date – if the original was analogue 16mm psychedelia, this is hard edged Hi-Def paranoia – and just like the original it makes you think, it fires the imagination and it makes you question, because the whole world really is The Village, you really are Number 6 and there really is no escape.